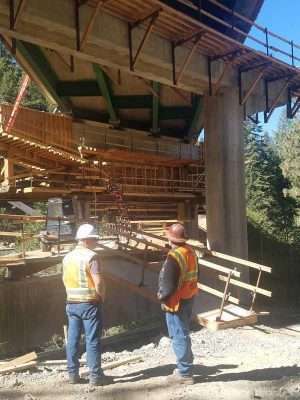 This spring, Plumas County residents encountered a traffic signal at the Spring Garden Bridge, 5 miles east of Quincy, that interrupted a normally fluid drive. It is quiet on top of the bridge, and if it weren’t for the signal and the extensive roadwork caution signs, commuters would probably never guess that underneath the 50-year-old bridge is a flurry of activity. 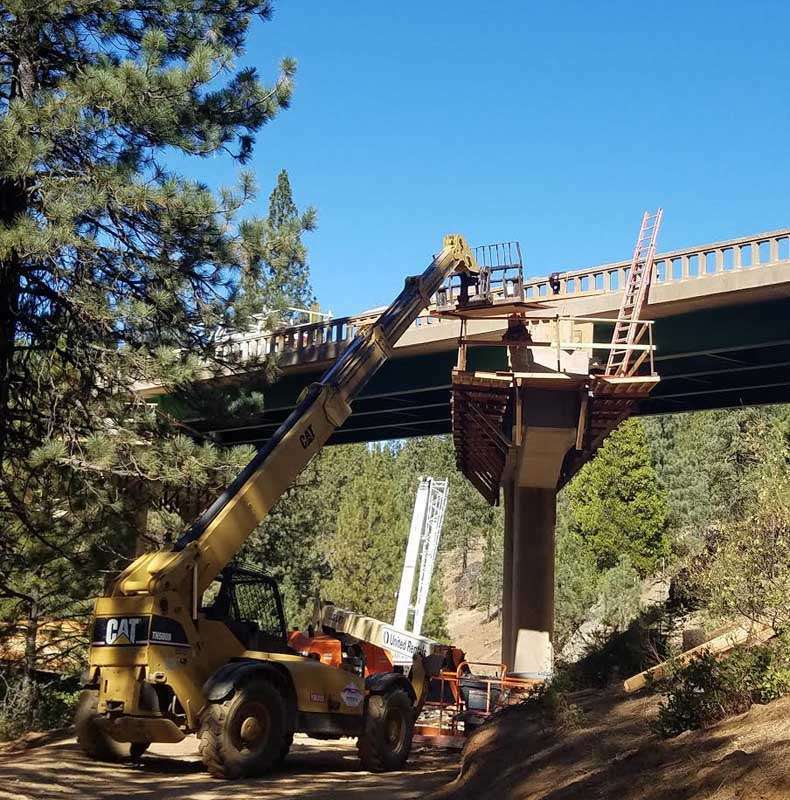 The $10.2 million bridge rehabilitation project has been in the California Department of Transportation’s repair lineup for about six to seven years and is estimated to take about two years, 1,200 cubic yards of concrete, and 600,000 pounds of steel to complete. Caltrans District 2 Resident Engineer Ron Collins said the project is difficult, but much needed. Because there are no alternate routes and the bridge has to remain functional for traffic, the project had to be divided into five stages, which, Collins said, is what slows down the process. “Our job this year is to do everything underneath the structure,” said Collins. With the help of MCM Construction Inc. from Sacramento, the bridge is already in Stage 2 of the process. The piers that hold up the bridge are lined with a massive amount of lumber and falsework (temporary construction) that will be removed when the project is done. The crew is made up of 12 to 30 construction workers a day who have filled walls with thousands of pounds of concrete and widened the bents that hold the deck. The result will be a 16-foot wider bridge, with a higher friction surface that should reduce the accident rate on the roadway, updated railing and even a new bike lane. Collins said the project will pause for the winter and the signal will be removed in November until weather permits the crew to start work again next spring. The next phase of work will then begin: repairing the deck, which will entail a complete replacement of the girders, supports and road surface, making one-way traffic a must. Collins said the traffic signal was a hard transition for drivers at first, and there have been a few occurrences of people who have run the red lights. Collins said CHP would have a stronger presence at the sight to curtail that problem. Collins also reported that most of the major repairs from the rough storms this winter have been addressed and preventative measures have been put in place to keep the damage from occurring again. Construction workers from MCM Construction work on widening the bents that hold the Spring Garden Bridge. The bridge will be 16 feet wider than the old bridge upon its completion. He reported that Plumas County highways have had an estimated $9.3 million worth of rehabilitation work done on them because of storm and flooding damage. “While we were repairing the roads we were preventing what happened from ever happening again,” said Collins. The highways now have new culverts, better drainage and wider shoulders that will combat flooding and rock slides more effectively. Canyon drivers should be alert and expect 10-minute delays when driving east past the Greenville turnoff on Highway 70 to the Spanish Creek Bridge starting today, Oct. 11. There will be one-lane traffic control as crews repair a retaining wall along that highway. The signals were no issue with us. Never had to wait very long even if we just missed the light. It will all be worth it to have fewer accidents. People just need to have more patients…..great job guys and gals!